Photo: Charles Curtis House, ca. 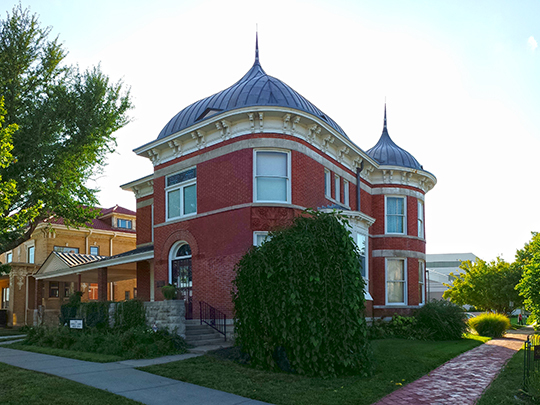 1879, 1101 Topeka Avenue, Topeka, KS. Listed on the National Register of Historic Places in 1973. Photographed by User:PurcellRyan (own work), 2013, [cc-by-3.0 (creativecommons.org/licenses/by/3.0)], via Wikimedia Commons, accessed March, 2014. The Shawnee County Courthouse is located at 200 Southeast Seventh Street, Topeka KS 66603; phone: 785-233-8200. By act of the Legislature Feb. 11, 1857, Shawnee and attached counties was constituted the second judicial district [of Kansas]. On the 20th of the same month the boundaries of Shawnee County were fixed as follows: Beginning at the southwest corner of Douglas county; thence west with the section lines to the corner of sections 14, 15, 22 and 23, town 15 south, range 13 east; thence north with the section line to the middle of the main channel of the Kansas river; thence down said river by the middle of the main channel thereof to the northwest corner of Douglas County; thence south with the west boundary of said Douglas County to the place of beginning, and simultaneously with the passage of this act the county was constituted the eleventh representative district. The first subdivision of the county into municipal townships was made by order of the County Board on the 24th of September, 1855, and by which order, all the territory laying north of the Wakarusa river was formed into Tecumseh township, and the territory south of that stream was organized under the name of Yocum Township. The next change of townships was made on the 23d of February, 1857, in anticipation of the election to be held in June for delegates to the Lecompton Constitutional Convention. The change at that time consisted of organizing Topeka Township, which was made to consist of all that portion of Tecumseh Township, as theretofore existing, and lying west of section line three miles west of the town of Tecumseh. In anticipation of the general election to be held in October of that year, however, a general reorganization of municipal townships was made on the 21st of September. At that time the county was divided into five municipal townships under the respective names of Tecumseh, Topeka, Brownsville, Burlingame and Wakarusa. Each township was declared to be an election precinct, and places for voting were designated and judges of election appointed by the county board, as follows: in Tecumseh Township, at the Court House. Judges of election: Eli Hopkins, James W. Lacy, Bennett A. Murphy. Topeka Township, at the Garvey House. Judges: Samuel T. Walkley, M. C. Dickey, Jeremiah Murphy. Wakarusa Township, at the trading house of Hudson and Lincoln. Judges: Aaron Cuberly, Milton Tharp, Wade W. Babcock. Brownsville Township, at Fox's Hotel. Judges : William Johnson, David Hammond, Daniel Turner. Burlingame Township, at the house opposite the Burlingame House. Judges: Thomas Russell, William Lord, C. D. Marple. This arrangement of voting precincts and election judges was everything that the Free State party could ask, as to convenience and character of men. Various circumstances had operated in Shawnee County to convince the pro-slavery men that it was useless longer to strive against the predominance of Free State sentiments, and, making a virtue of necessity, they had wisely determined to invite a fair and honorable trial of strength at the polls, and if results should so determine, to gracefully yield the county government to the Free State party. Giles, F. W., Historical Sketch of Shawnee County Kansas, prepared for the occasion of the Centennial Celebration, July 4, 1876; Commonwealth Steam Book and Job Printing House, Topeka, 1876.